Extensive information about the sanctuary can be found on the trust’s web site. 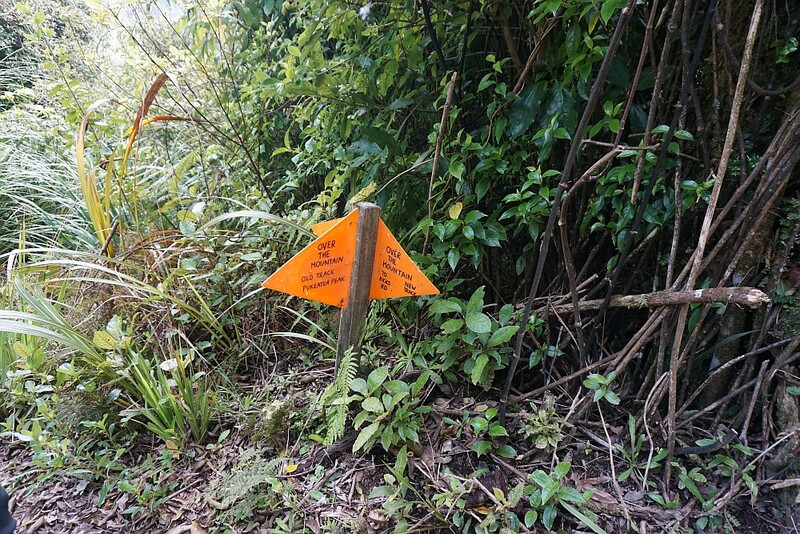 A wide gravelled track suitable for quad bikes has been constructed between Tari Rd and Maungatautari peak. The intention is to continue this to the northern entrance to the sanctuary, providing an easier over-the-mountain route. 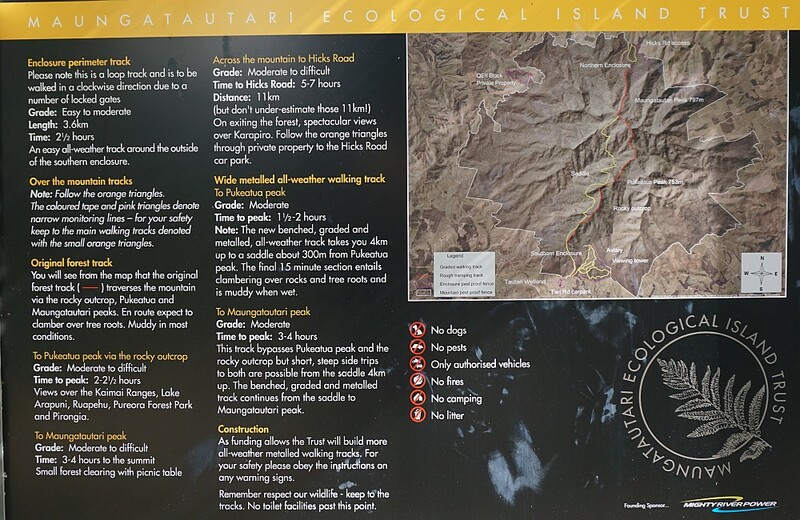 Currently the original track can be followed from Pukeatua peak to Maungatautari peak and onward to the northern enclosure, and for part of the way between Tari Rd and Pukeatua peak. 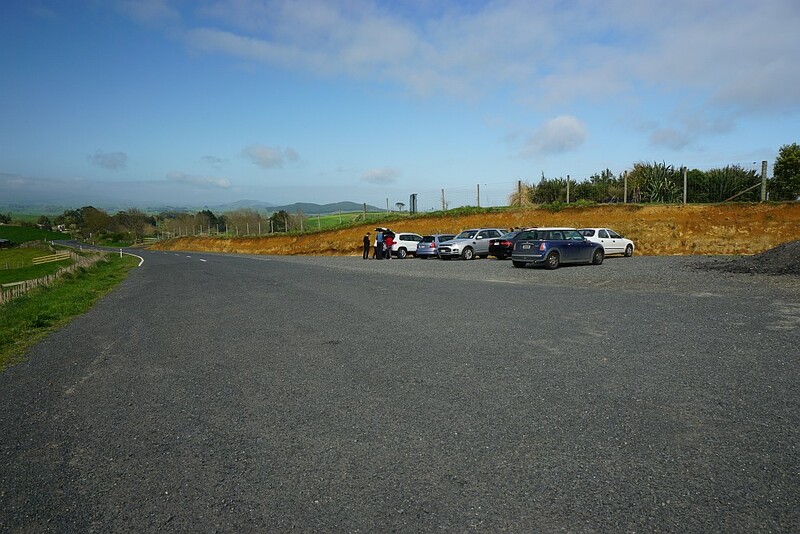 The parking area at the end of Tari Rd. 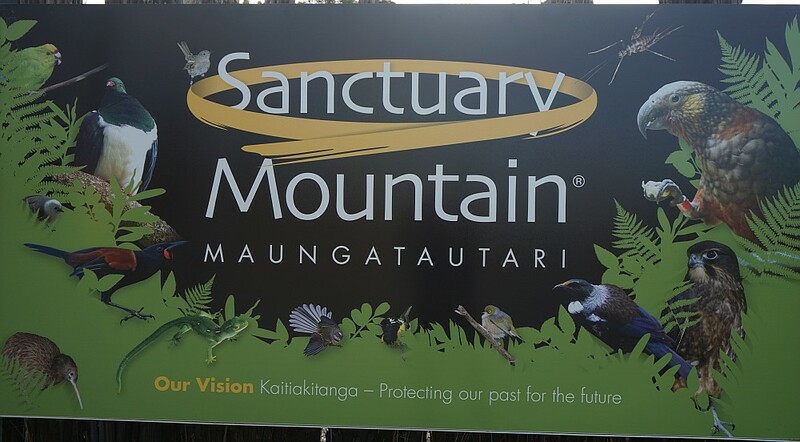 Sign at the entrance to Sanctuary Mountain, showing some of the native birds offered protection within the forest. 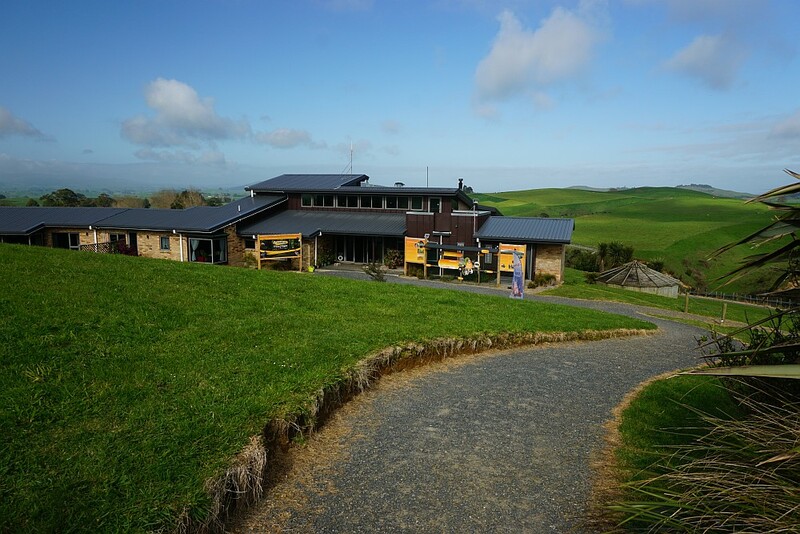 The visitor centre at the end of Tari Rd. This has information about the sanctuary and its construction, and the walking tracks within. 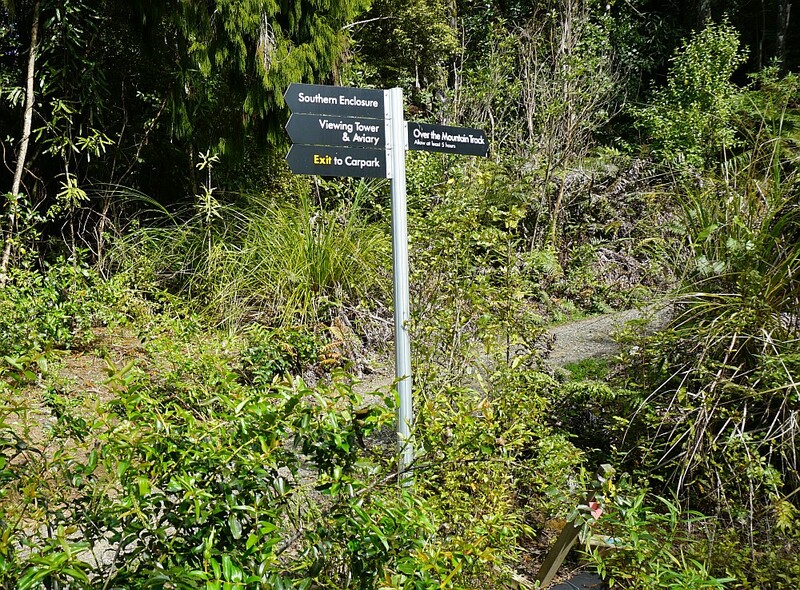 There is a charge for access to the southern enclosure and for access and a guide to the tuatara enclosure, payable at the centre. There are also toilets in the visitor centre. 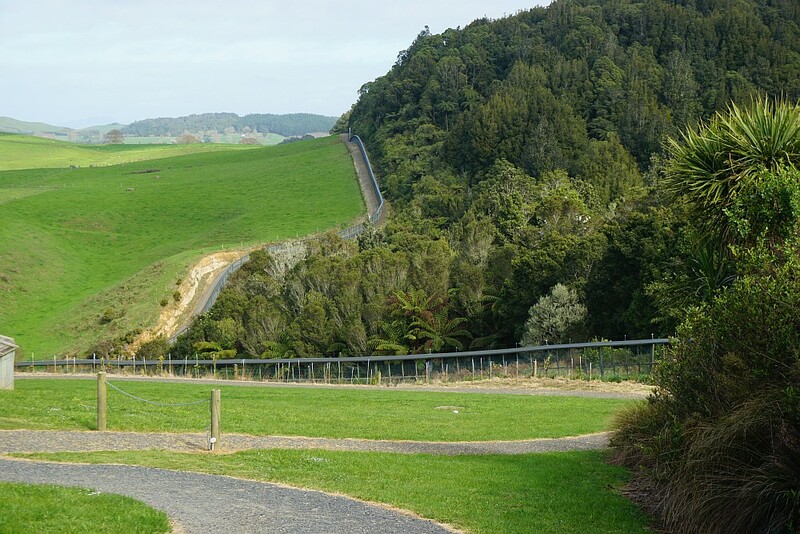 The predator proof fence can be seen along the edge of the forest near the visitor centre. To the right the new entrance to the walking tracks within the sanctuary. The path to the left leads to the visitor centre. 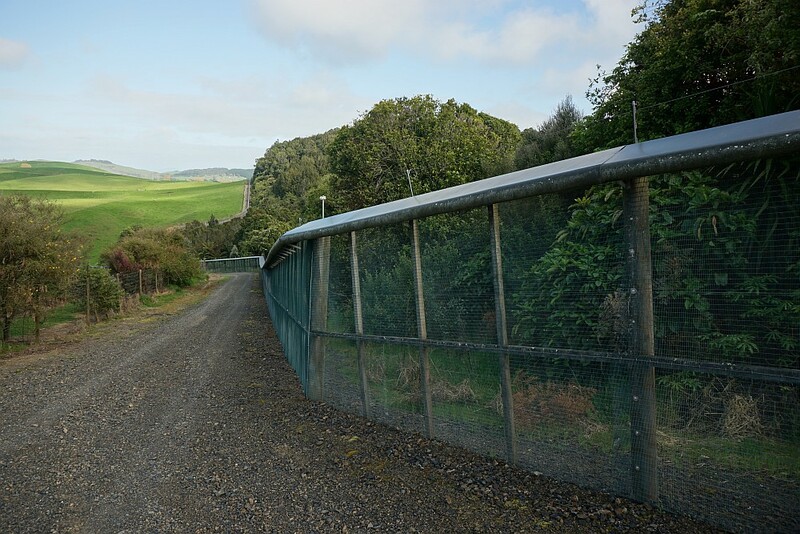 The predator proof fence by the track entrance. The electric fence wire at the top of the fence provides warning if branches fall down across the fence. The mesh is fine enough to stop mice from entering, and goes underground to prevent rabbits from tunneling inside. Entry to the sanctuary is through a cage where only one door can be open at any time. Information panel inside the sanctuary with details of the various tracks. 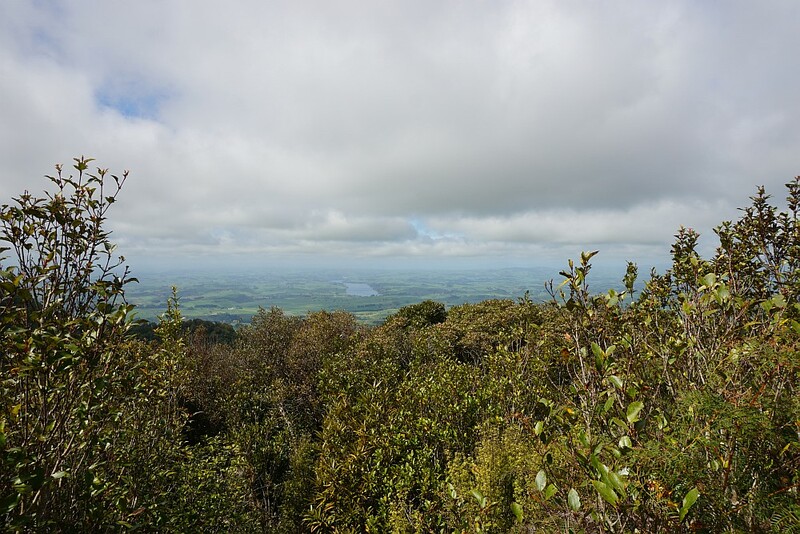 This walk was done on the all-weather walking track to the saddle between Pukeatua Peak and the rocky outcrop, then on the original forest track to Pukeatua peak and where possible on the way back to Tari Rd. The all-weather track continues up the hill to the right from the perimeter fence around the southern enclosure. 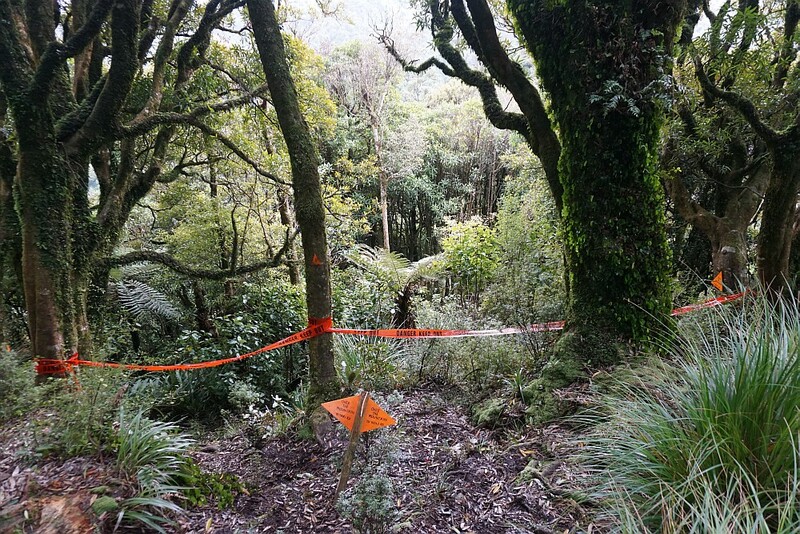 The remains of the original forest track between Tari Rd and Pukeatua peak consists of two sections. The lowest one is a short, easy section running quite close to the new track. The southern end of this part branches off here, with the new track on the left and the original track on the right. The northern end of the short piece of original forest track. 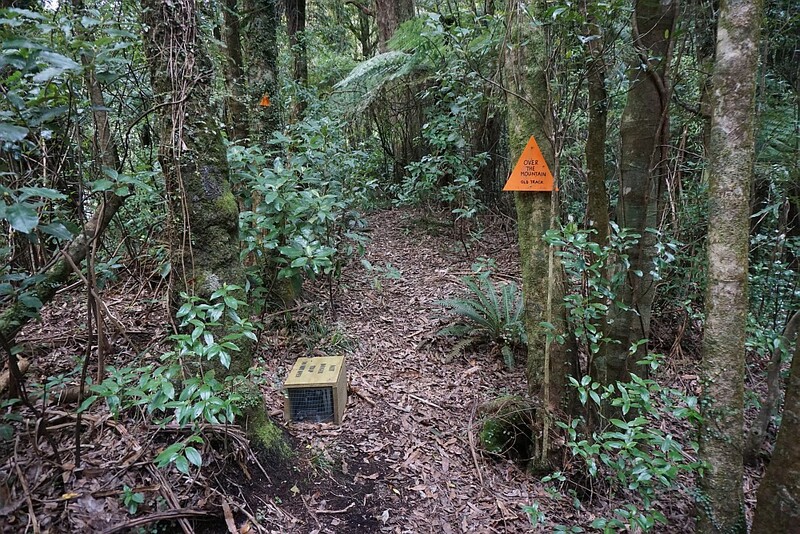 One of the many traps, this one for stoats, ferrets and weasels, can be seen by the track. 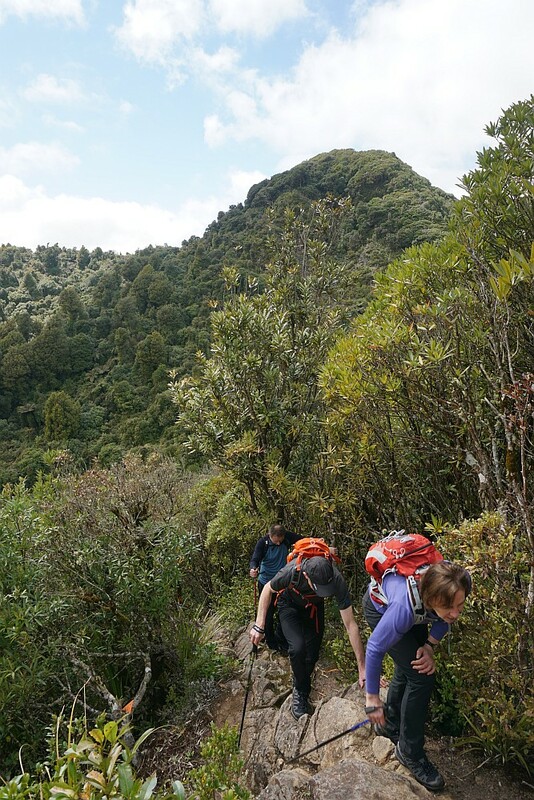 The second part of the original forest track is somewhat longer and steeper that the first part, and crosses over the rocky outcrop near the saddle before reaching Pukeatua peak. This is the southern end of the second part. 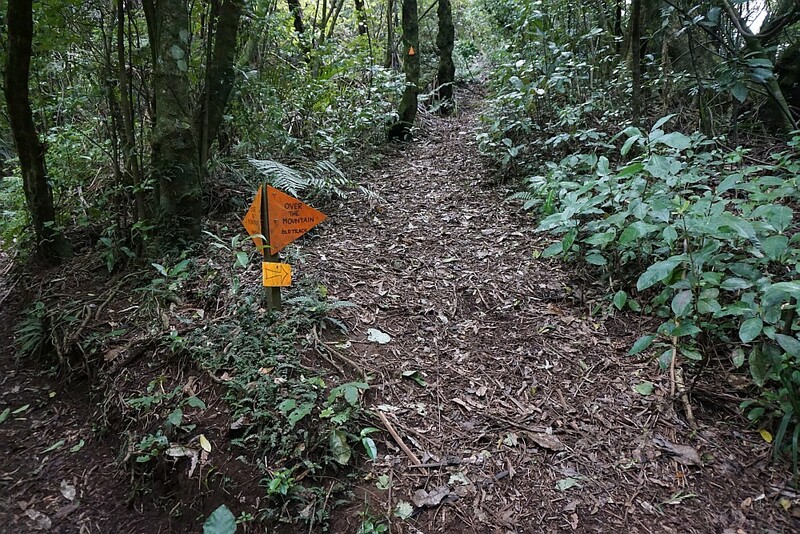 The new track is suitable for quad bikes, as used by the staff setting and checking the traps. 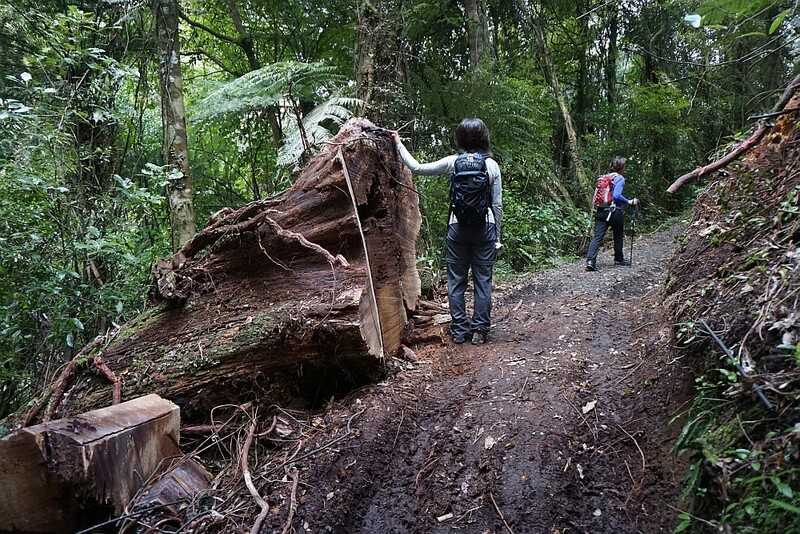 A recently fallen tree has been trimmed to allow the track to be used again. 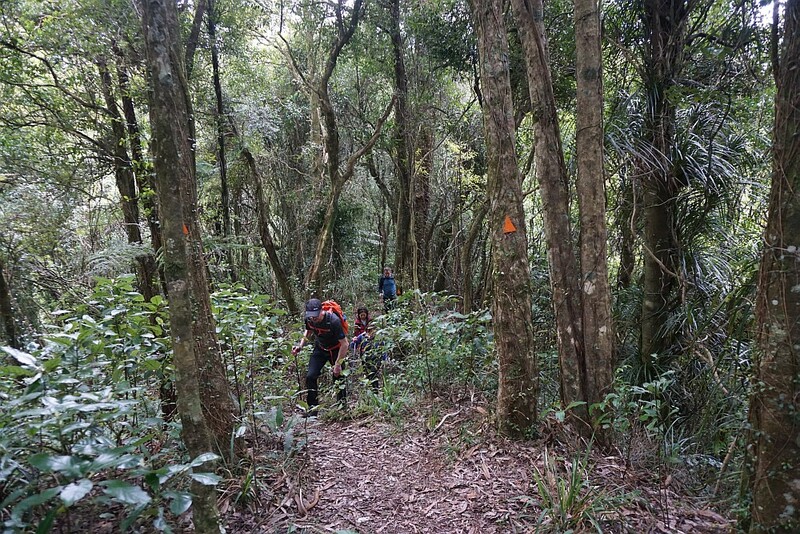 A short side track to the saddle branches off the main track which continues on to Maungatautari peak. The new track back to Tari Rd is on the right. 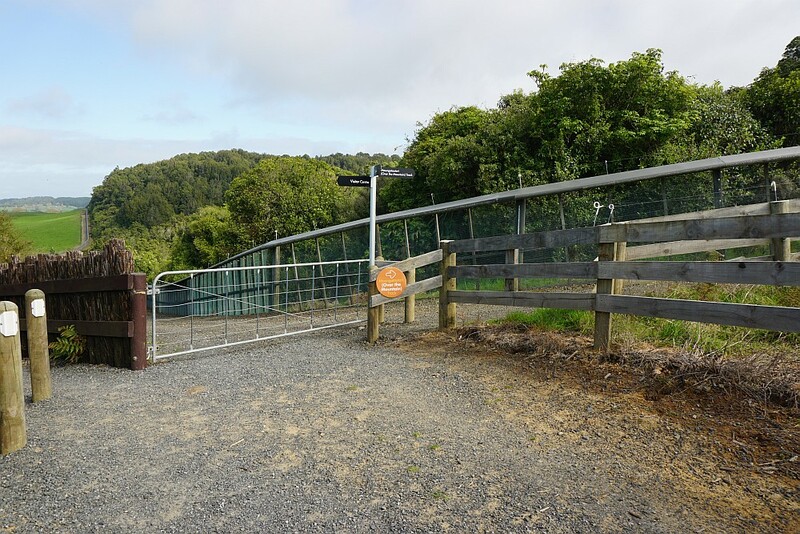 The start of the track to Pukeatua peak, the rocky outcrop, and a bench and rest area, is on the left. The sign by the junction shown above. 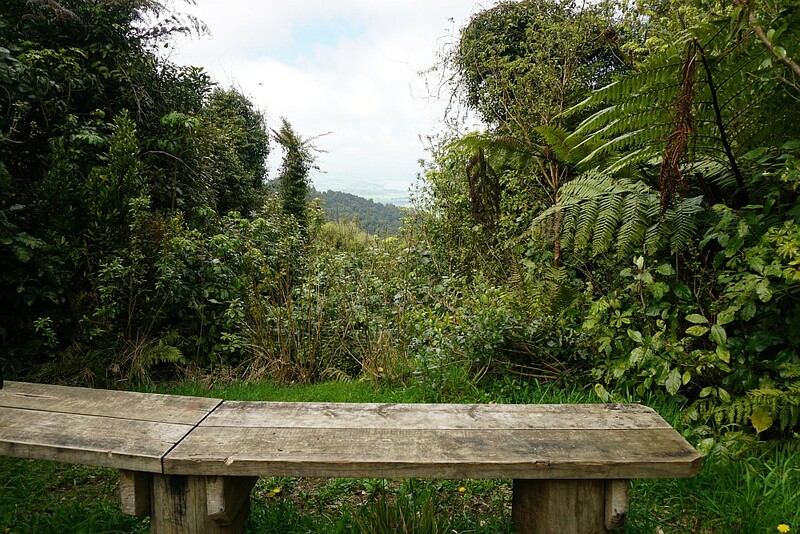 The bench seat on the saddle between Pukeatua peak and the rocky outcrop. Looking from the bench seat to Lake Arapuni. 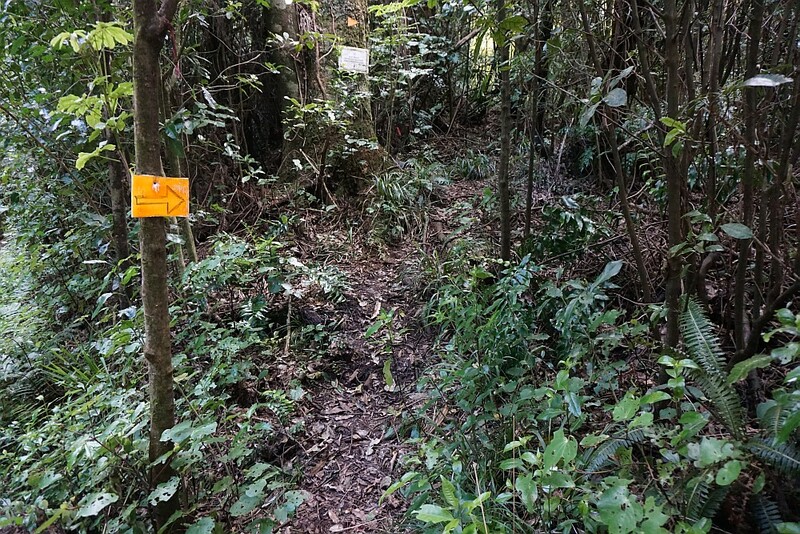 The start of the track from the saddle to Pukeatua peak, and the original forest track to Maungatautari peak. 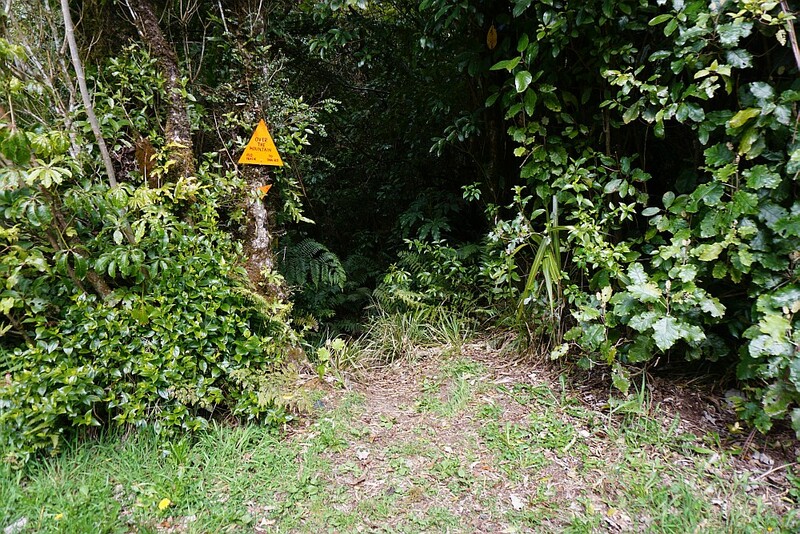 The junction of the original forest track and the track to Pukeatua peak. 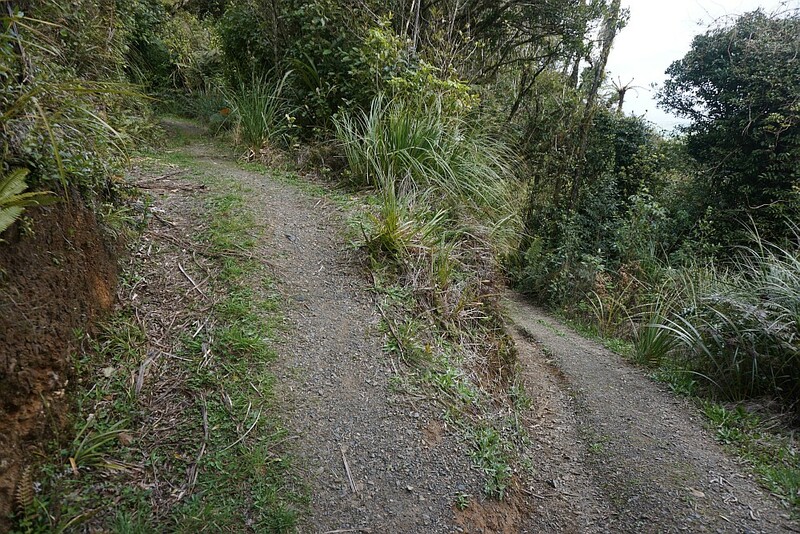 The track back to the saddle is on the left, to Maungatautari on the right. 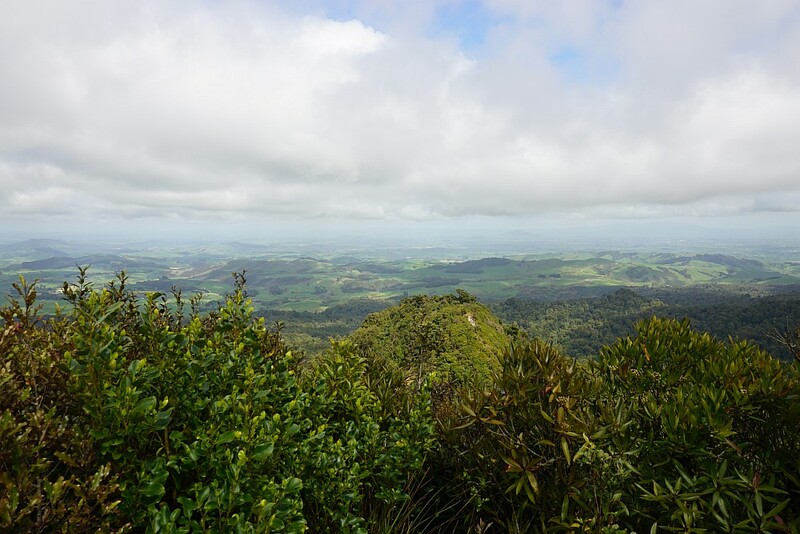 Looking towards the south-west from Pukeatua peak. 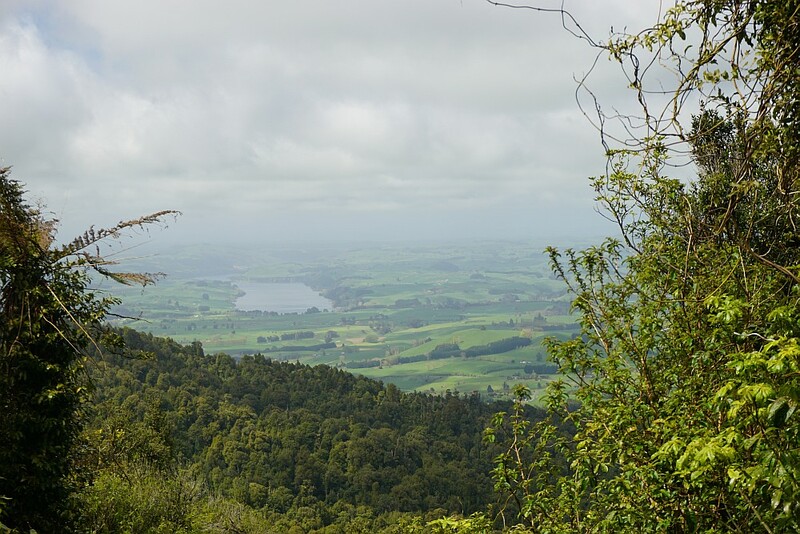 Looking south-east from Pukeatua peak. Lake Arapuni can be seen at picture centre. Back at the bench by the saddle, and the start of the old track back to Tari Rd via the rocky outcrop. 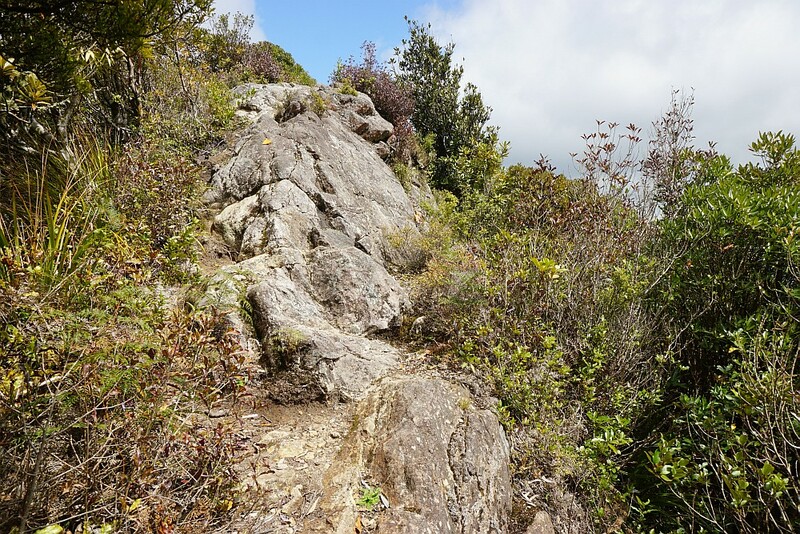 The track to the rocky outcrop is narrow and steep. Pukeatua peak can be seen at the upper right. The rocky outcrop consists of a number of large rocks where most of the soil around them has eroded away. The hillside to the right is very steep. From the rocky outcrop looking towards Maungatautari. There are extensive views across the valley to the west (left of photo). 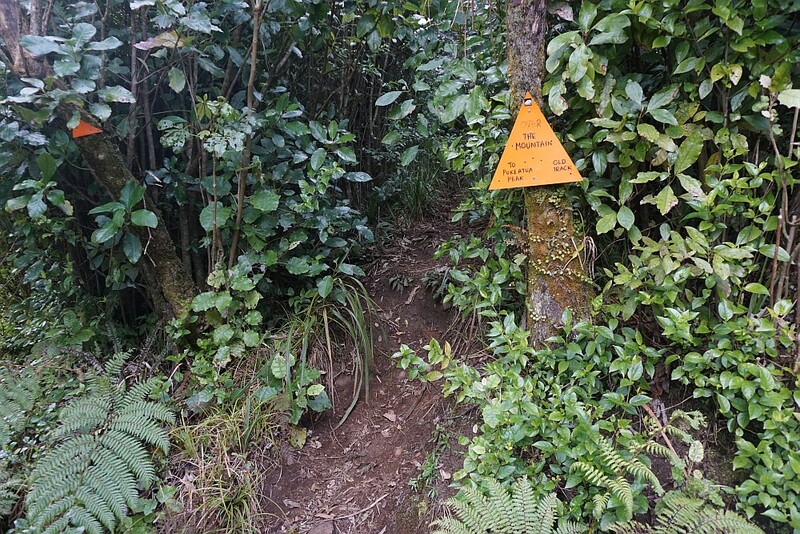 The original forest track heading back from the rocky outcrop towards Tari Rd is narrow and very steep in places, but well marked. 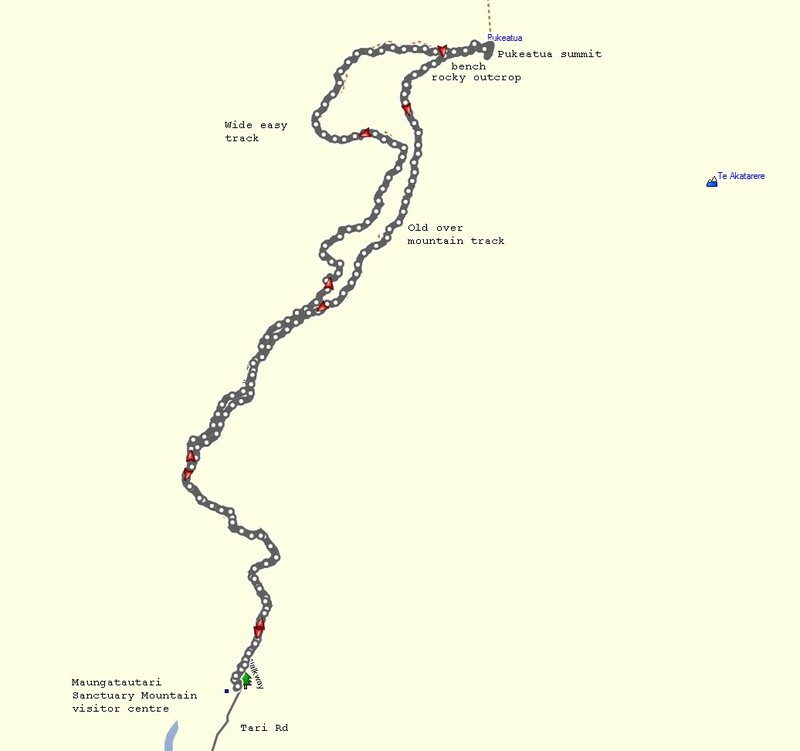 The GPS tracklog shows the routes followed, with the new track to the west and the original forest track on the right. Total distance walked was about 9.1 km, with a time of 3 hours 50 minutes. From Tari Rd via the new track to the bench on the saddle was about 4.3 km, and took 1 hour 15 minutes. From the bench to Pukeatua peak took about 20 minutes. From the bench via the rocky outcrop and the original forest track back to Tari Rd was about 40 km and took 1 hour 40 minutes. 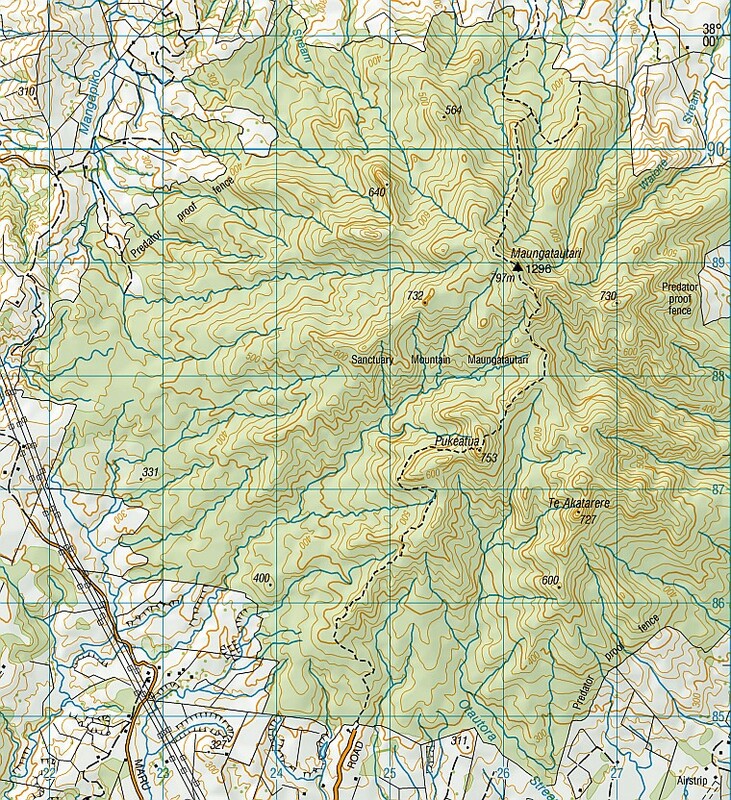 A topographic map showing most of the ecological sanctuary. The track was walked on October 11, 2015. It’s good to hear that you are finding the blog entries useful. Thank you for the comments. The tracks across the mountains are free of charge. You do not enter either the southern or northern enclosure to walk those tracks. 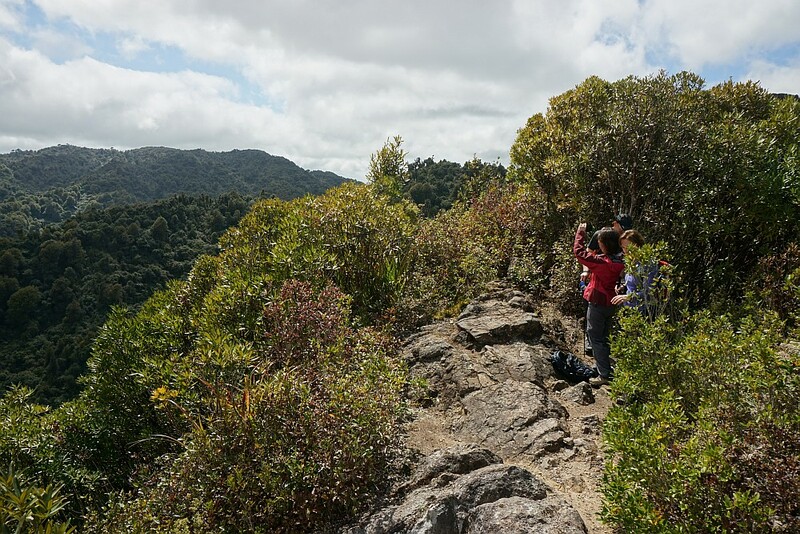 There is a quad bike track, now called Wairere Traverse, and the tramping track, now called Te Raki Track at the northern end, and Te Tonga Track from about the summit of Maungatautari to the southern entrance, which run more or less parallel to each other, and share the same track for part of the way between the southern entrance and Pukeatua. The northern enclosure is also free. Although these tracks are free I usually leave a donation in one of the boxes to support the great work the trust is doing. 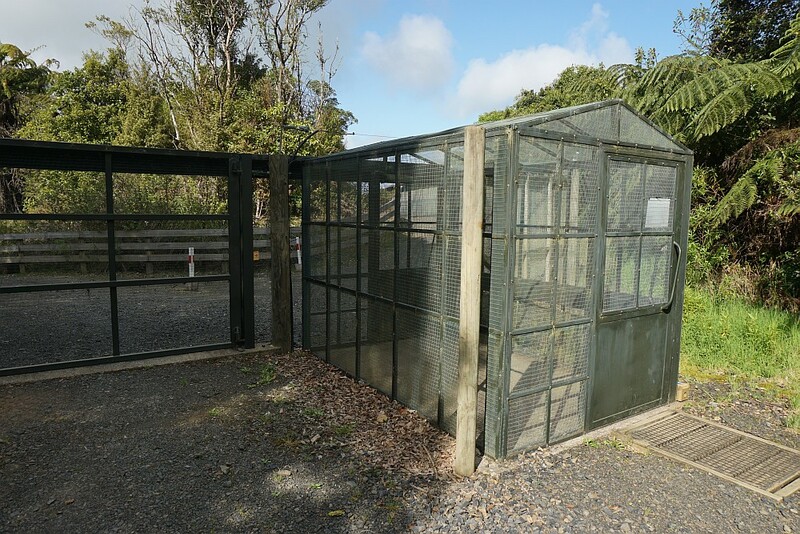 There is a charge for entry to the southern enclosure and for the guided tour of the tuatarium.